I’m going to be inking them today when I wake up, so hopefully they’ll be done by tonight so I can start colouring them on Wednesday. I only did 5 instead of 8, but that basically means that the next batch after this one is going to be 3 pages and then I get to do the next cover, which I am super jazzed about. Anyhow, one more thing of note! 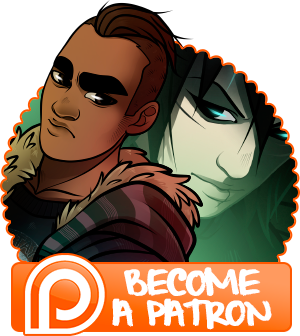 We changed up our goals on Patreon. If we hit $250/month, we will be setting aside time and scheduling time with friends to record the alt text adventure for this very chapter as a short radio drama, complete with sound effects and cheesy dramatic stock music. We are currently at $208.75, so it’s not too far! Check out it and future goals here. And last but not least, the poll! Before I ask you to vote, I’m going to remind you not to cheat. Each IP only gets one vote, and I’ll be deleting all duplicates, but I’m also not totally clueless and if I see a burst of 50+ votes with different IP addresses, all for the same character and all one after the other, I can put two and two together and remove those, too. I want to draw what most of you want me to draw, not what one or two people with a free hour and the willingness to spam vote for a single character over and over want me to do. It’s not fair to everyone else, and it’s not fair to me, either. That said, there’s still another week and a half to go, so if you haven’t voted yet, now’s a good time to do so!